Home / BRIC Blog / If Your Life Was A Museum, What Would Be On Display? This month’s blog post about the Future Historical Society was written by FHS member Jerry Pura. Originally from Melbourne, Australia, Jerry fell in love with Fort Greene during a visit to Brooklyn in 2012, and he’s lived here ever since. Below, Jerry explains how the storytelling ‘tasks’ assigned prior to each FHS meeting help build empathy, trust, and community amongst members. You can submit your own responses and stories to fhs@bricartsmedia.org. Hi there, I’m Jerry Pura and I’m honored to compose this blog post on behalf of the Future Historical Society (FHS). I’ve spent many years listening, learning and getting to know my neighbors in Fort Greene and beyond, and I’m relishing this opportunity to contribute to and assist in building the FHS. The Future Historical Society began in December 2018, when 24 strangers assembled at BRIC House to work together to create a public art project about Fort Greene. I was both excited and nervous and was immediately struck by the breadth of experiences and humanity in the room. Before our first meeting, the lead artist for the group, Yazmany Arboleda, assigned us each a ‘task’ that we had to complete, ‘adult homework’ of sorts. Since then, we’ve been meeting twice a month as we prepare to launch our first project at the BRIC OPEN Festival in April. Before each meeting, we are asked to complete a different task, each one prompting a new story about ourselves, our histories, and our values. Raha Behnam is a woman of movement and expression, and I admire her greatly. She shared a family portrait. This photograph of her immigrant family was taken at a portrait studio located inside of a McDonalds, located inside of a Walmart, located insides of a suburban mall. As Raha put it “It reminds me of the kitschy hilariousness of building a life”. 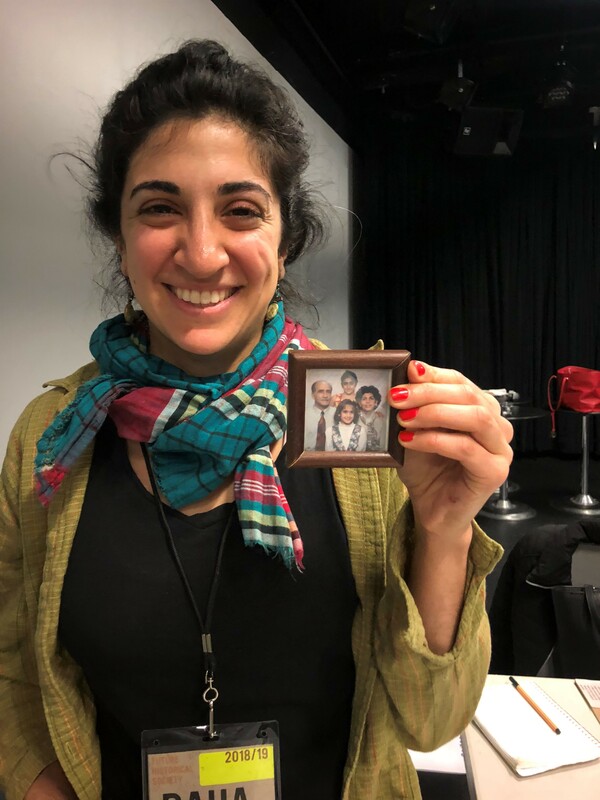 The story of this portrait exemplifies the spirit and humor inherent in Raha’s personality and offered a beautiful and unique insight into her life and the journey of her family from Iran to the United States. What moved me was how through this object, the Dez Doll, Desiree shared her own story of overcoming financial burdens, feeling freedom within herself, and how this doll helped remind her that “I have been sculpted out of miraculous organic material, a living statuette with a figure worthy of regard.” ‘Dazzling Dez’ radiated as a physical reminder of her own struggles to see and believe in herself and to hold no fear. 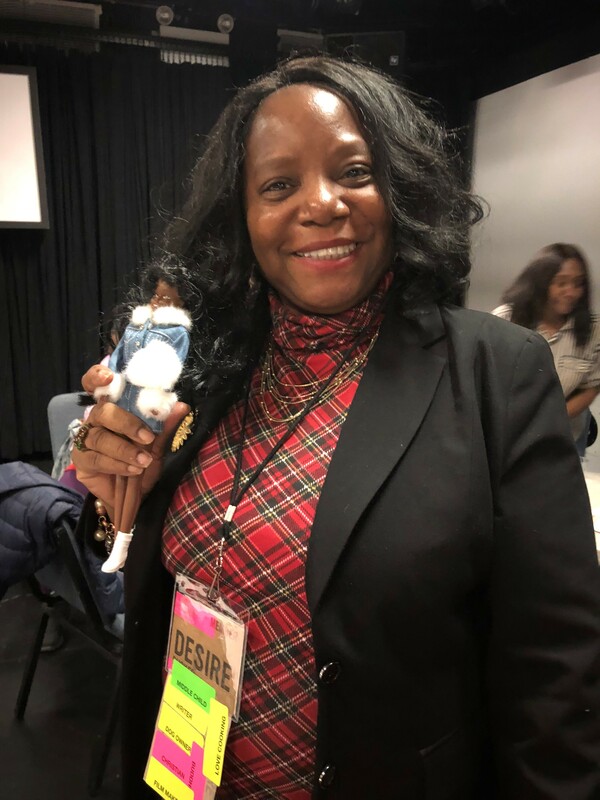 This spirit was personified in the ‘Dazzling Dez Doll’ and it continues to provide inspiration and contribute to her sense of identity today. Byoffering these types of personal stories within the group, we began building rich environment where we now feel comfortable sharing profound and often vulnerable parts of our lives and histories. We’re super honored and excited for our project coming up in April, and will be sharing more of the process along the way! How would you respond to this first task, or any of the other pictured above, if they were assigned to you? Send us your submissions at fhs@bricartsmedia.org, and feel free to reach out for more information on our work, and to keep up to date with what’s next for the FHS. 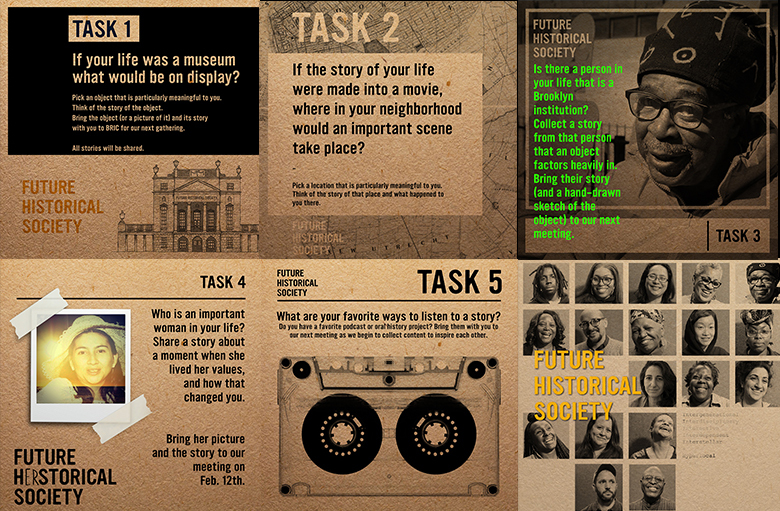 The Future Historical Society is a multi-generational team of community members joining together to create a neighborhood archive that honors the histories of our changing community, while transforming our vision for the future. The project will be installed throughout Fort Greene and Downtown Brooklyn during the BRIC OPEN Festival, April 24-27 2019. You can read more about the Future Historical Members here.